Mexico and some European destinations. They’ve now just released two updates to their collection: The Southwest (US) and The Alps and Beyond. Marty Berke is a long-time touring rider, MSF instructor, and writer who’s also done a book for Whitehorse on New England … so he’s got the U.S. pretty well covered, at least diagonally. This second edition, just published, covers the four states of Utah, Colorado, Arizona, and New Mexico. It is "completely updated," meaning that road conditions, hotel and camping recommendations, and restaurant reviews are all current. Famous roads are included — Route 66, Pikes Peak Highway, etc. — but most of the book is devoted to small roads you’d never likely hear of if you didn’t live in the area. The book is set up in 64 "chapters," each describing a day-long trip with recommendations on everything from food to scenery. Topographic maps and lots of crisp b&w photos make the directions easy to follow. If you’ve never ridden in these states (and I have just a little, enough to know I want more), this is a good reference book to use for a start. You’d think that getting an American to write a book about the best roads in Europe would be a bit silly, but author John Hermann, has been exploring such roads since 1975 and likes to go and do this twice a year, so he likely know more about them than most locals. 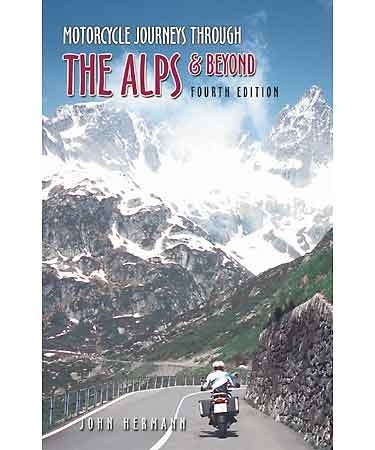 I’ve had the pleasure of checking out some of what the Alps has to offer as well as some of the other areas covered by this book, namely the Pyrenees and the Picos de Europa, and for sure these places are compulsory experiences for any motorcyclist to ride before they die. 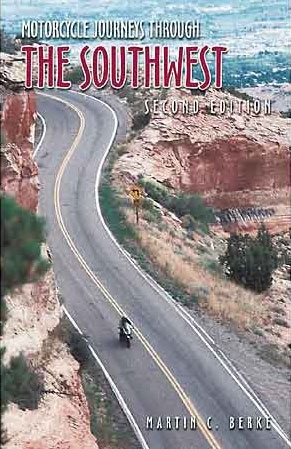 Motorcycle Journeys through the Southwest, by Martin C. Berke, softbound, 318 pp, b&w illustrations, $19.95 U.S. and Motorcycle Journeys through the Alps and Beyond, by John Hermann, softbound, 416 pp, colour illustrations, $29.95 U.S. Both books are published by Whitehorse Press, Centre Conway, NH, www.WhitehorsePress.com , ISBN 978-1-884313-66-0. Previous PostSmoggy blender in troubleNext PostMy, that's a quiet race!